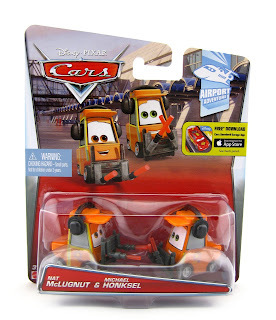 From Cars 2, here we have this brand new Mattel 1:55 scale diecast release of Nat McLugnut & Michael Honksel! This great 2-pack of air marshalls is part of the 2015 "Airport Adventure" sub-series (#s 4/5 out of 6). This is the first these characters have ever been released- and they have a fun look to them! I love their orange color, headsets and glow signals. They're a bit bigger (well, at least taller) than previous pitty releases as well. As shown in the screen shot above, at least one of these guys can be seen directing the plane before Lightning and his "95 Pit Crew" take off to Tokyo (right at the beginning of the "You Might Think" travel montage). You can find this one in stores (or online) now! I found it at Target just last week. Good luck on the hunt!